La paniculitis lúpica es un subtipo del lupus cutáneo de etiología autoinmunitaria que puede estar relacionada con otras formas de lupus cutáneo, lupus sistémico u otras enfermedades autoinmunitarias. Clínica e histológicamente puede confundirse con el linfoma subcutáneo de células T similar a la paniculitis. El tratamiento de este tipo de paniculitis no se ha estandarizado dada la baja prevalencia de la enfermedad. Se presenta una revisión de los aspectos epidemiológicos, histopatológicos, clínicos y terapéuticos de la paniculitis lúpica. Lupus panniculitis is a subtype of cutaneous lupus with an autoimmune etiology that may be related to other forms of cutaneous lupus, SLE and other autoimmune diseases. Clinically and histologically it may be diagnosed as subcutaneous panniculitis-like T-cell lymphoma. Treatment of this type of panniculitis has not been standardized given the low prevalence of the disease. We review the epidemiological, histopathological, clinical, and therapeutic aspects of lupus panniculitis. panniculitis, lupus erythematosus; lupus erythematosus, cutaneous; lymphoma, T-cell. Figura 1. Paniculitis lúpica asociada a lupus discoide. Mujer de edad media con placas eritematosas queratósicas que dejan cicatrices atróficas e hipocrómicas en el dorso nasal correspondientes a lupus discoide. Figura 2. Manifestaciones clínicas de la paniculitis lúpica. Nódulos violáceos indurados y dolorosos a la palpación en la región infraescapular y la lumbar izquierda (recuadro). Área lipoatrófica en una paciente con paniculitis lúpica (flecha). Figura 3. Biopsia de piel y tejido celular subcutáneo en la cual se destaca una paniculitis linfocítica de predominio lobulillar, sin vasculitis. Hematoxilina y eosina, 20X. Figura 4. Áreas de necrosis fibrinoide que rodean lobulillos del tejido celular subcutáneo con infiltrado linfoide. hematoxilina y eosina, 40X. Arnold HL.Lupus erythematosus profundus (Kaposi-Irgang) historical review and report of a case. Arch Derm Syphilol. 1948;57:196-203. Irgang S. Lupus erythematosus profundus: Report of an example with clinical resemblance to Darier-Roussy sarcoid. Arch Dermat Syph. 1940;42:97-108. Arnold HL. Lupus erythematosus profundus; commentary and report of four more cases. AMA Arch Derm. 1956;73:15-33. Fountain RB. Lupus erythematosus profundus. Br J Dermatol. 1968;80:571-9. Winkelmann RK. Panniculitis and systemic lupus erythematosus. JAMA. 1970;211:472-5. Tuffanelli DL. Lupus erythematosus panniculitis (profundus): Clinical and immunologic studies. Arch Dermatol. 1971;103:231-42. Fraga J, García-Díez A. Lupus erythematosus panniculitis. 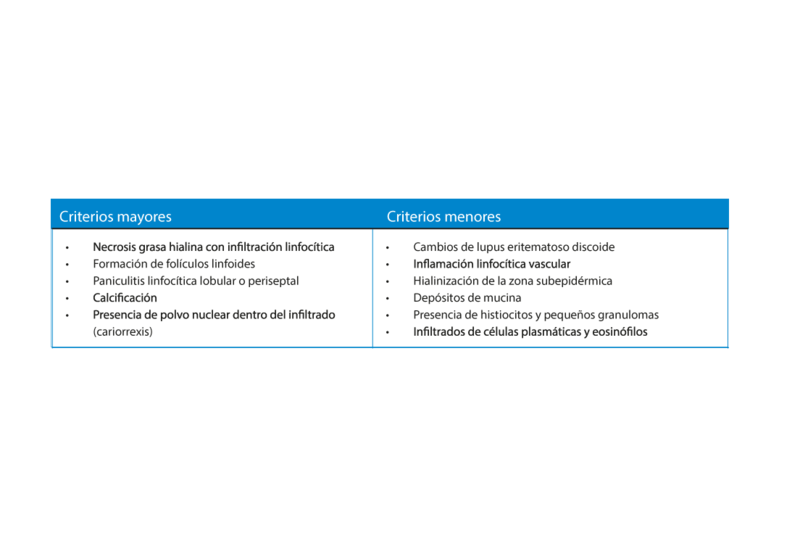 Dermatol Clin. 2008;26:453-63. Massone C, Kodama K, Salmhofer W, Abe R, Shimizu H, Parodi A, et al. Lupus erythematosus panniculitis (lupus profundus): Clinical, histopathological, and molecular analysis of nine cases. J Cutan Pathol. 2005;32:396-404. Martens PB, Moder KG, Ahmed I. Lupus panniculitis: Clinical perspectives from a case series. J Rheumatol. 1999;26:68-72. De la Moneda Herrerin C, Conde Zurita JM, Guerra Tapia A. El lupus paniculitis: una paniculitis mixta. Actas Dermosifiliogr. 1987;78:229-38. Peters MS, Su WP. Lupus erythematosus panniculitis. Med Clin North Am. 1989;73:1113-25. Tuffanelli DL. Lupus erythematosus (panniculitis) profundus: A classic revisited commentary and report of 22 cases. Hawaii Med J. 1992;41:394-7. 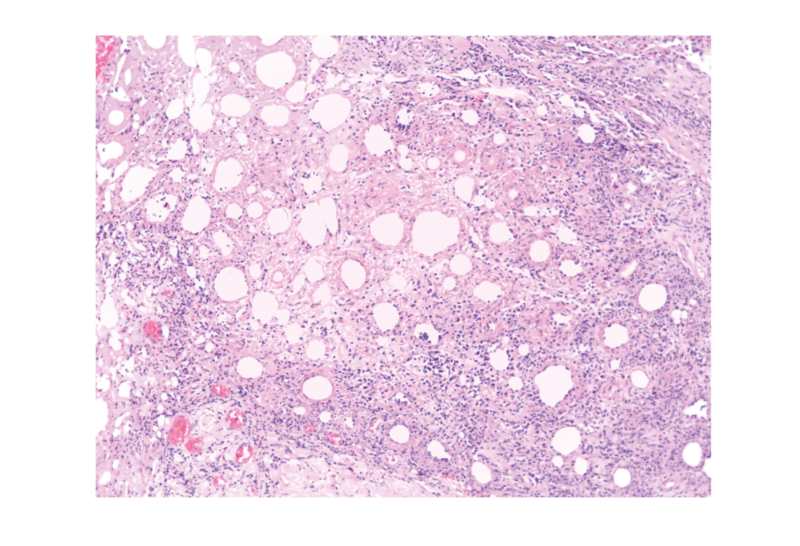 Magro CM, Crowson AN, Kovatich AJ, Burns F. Lupus profundus, indeterminate lymphocytic lobular panniculitis and subcutaneous T-cell lymphoma: A spectrum of subcuticular T-cell lymphoid dyscrasia. J Cutan Pathol. 2001;28:235-47. Nousari HC, Kimyai-Asadi A, Provost TT. Generalized lupus erythematosus profundus in a patient with genetic partial deficiency of C4. J Am Acad Dermatol. 1999;41:362-4. Wenzel J, Tüting T. Identification of type I interferon-associated inflammation in the pathogenesis of cutaneous lupus erythematosus opens up options for novel therapeutic approaches. Exp Dermatol. 2007;16:454-63. Wenzel J, Proelss J, Wiechert A, Zahn S, Bieber T, Tüting T. CXCR3-mediated recruitment of cytotoxic lymphocytes in lupus erythematosus profundus. J Am Acad Dermatol. 2007;56:648-50. Abreu-Velez AM, Loebl AM, Howard MS. Autoreactivity to sweat and sebaceous glands and skin homing T cells in lupus profundus. Clin Immunol. 2009;132:420-4. Tuffanelli DL. Lupus panniculitis. Semin Dermatol. 1985;4:79-81. Patterson JW. Panniculitis. En: Bologna JL, Jorizzo JL, Rapini RP, editores. Dermatology. Londres: Mosby; 2010. p. 1653-4. Klein SA, Tomaro AJ. Lupus erythematosus profundus: Review of the literature and report of case. J Oral Surg. 1975;33:454-7. Carducci M, Mussi A, Lisi S, Muscardin L, Solivetti FM. Lupus mastitis: A 2-year history of a single localization of lupus erythematosus mimicking breast carcinoma. J Eur Acad Dermatol Venerol. 2005;19:260-2. Sabaté JM, Gómez A, Torrubia S, Salinas T, Clotet M, Lerma E. Lupus paniculitis involving the breast. Eur Radiol. 2006;16:53-6. White WL, Sherertz EF, Berg D, Clark RE. Periparotid lupus erythematosus panniculitis: Clinic pathologic correlation of two cases presenting as primary parotid disease. Arch Pathol Lab Med. 1993;117:535-9. Ogura N, Fujisaku A, Jodo S, Ichikawa K, Tsutsumi A, Mukai M, et al. Lupus erythematosus profundus around the salivary glands: A case resembling submandibular gland disease. Lupus. 1997;6:477-9. Sardana K, Mendiratta V, Koranne RV, Verma R, Vig R. Lupus erythematosus profundus involving the ear lobe. J Eur Acad Dermatol Venerol. 2003;17:727-9. Tamada Y, Arisawa S, Ikeya T, Yokoi T, Hara K, Matsumoto Y. Linear lupus erythematosus profundus in a young man. Br J Dermatol. 1999;140:177-8. Nagai Y, Ishikawa O, Hattori T, Ogawa T. Linear lupus erythematosus profundus on the scalp following the lines of Blaschko. Eur J Dermatol. 2003;13:294-6. Chan I, Robson A, Mellerio JE. Multiple dermatofibromas associated with lupus profundus. Clin Exp Dermatol. 2005;30:128-30. García-Doval I, Roson E, Abalde M, Feal C, Cruces MJ. Coexistence of acquired localized hypertrichosis and lipoatrophy after lupus panniculitis. J Am Acad Dermatol. 2004;50:799-800. Nousari HC, Kimyai-Asadi A, Provost TT.Generalized lupus erythematosus profundus in a patient with genetic partial deficiency of C4. J Am Acad Dermatol. 1999;41:362-4. Cribier B. Panniculite lupique. Presse Med. 2005;34:243-8. Patterson JW. Panniculitis. En: Weedon D, Geoffrey S, Adam IR, editors. Weedon’s Skin Pathology. Edinburgh: Churchill Livingstone/Elsevier, 2010. p. 542-3. Patterson JW. Differential diagnosis of panniculitis. Adv Dermatol. 1991;6:309-29. Barnhill RL, Crowson AN. Panniculitis. Textbook of Dermatopathology. 2nd edition. New York: McGraw-Hill; 2004. p. 267-98. Arai S, Katsuoka K. Clinical entity of lupus erythematosus panniculitis/lupus erythematosus profundus. Autoimmunity Reviews. 2009;8:449-52. Luzar C. Inflammatory diseases of cutaneous fat: Lupus erythematosus profundus. En: Calonje E, Brenn T, Lazar A, McKee PH, editors. McKee’s pathology of the skin: with clinical correlations. 4th ed. Edinburgh: Elsevier/Saunders; 2012. p. 358-360. Hansen CB, Callen JP. Connective tissue panniculitis: Lupus panniculitis, dermatomyositis, morphea/scleroderma. Dermatol Ther. 2010;23: 341-9. Cusack CA, Fanelli M. Panniculitis. En: Lebwohl MG, Heymann WR, Berth-Jones J, eitors. Treatment of Skin Diseases: Comprehensive Therapeutic Strategies. Fourt edition. Philaderphia: Saunders; 2013. p. 528-9. Braunstein I, Werth VP. Update on management of connective tissue panniculitides. Dermatol Ther. 2012;25:173-82. Kuhn A, Landmann A. The classification and diagnosis of cutaneous lupus erythematosus. J Autoimmun. 2014;48-49:14-9. Ziemer M, Milkova L, Kunz M. Lupus erythematosus. Part II: Clinical picture, diagnosis and treatment. J Dtsch Dermatol Ges. 2014;12:285-301. Morgan KW, Callen JP. Calcifying lupus panniculitis in a patient with subacute cutaneous lupus erythematosus: Response to diltiazem and chloroquine. J Rheumatol. 2001;28:2129-32. Chatham WW, Kimberly RP. Treatment of lupus with corticosteroids. Lupus. 2001;10:140-7. Yell JA, Burge SM. Lupus erythematosus profundus treated with clobetasol propionate under a hydrocolloid dressing. Br J Dermatol. 1993;128:103. González-Sixto B, García-Doval I, Oliveira R, Posada C, García-Cruz MA, Cruces M. Quinacrine in the treatment of cutaneous lupus erythematosus: Practical aspects and a case series. Actas Dermosifiliogr. 2010;101:54-8. Page F. Treatment of lupus erythematosus with mepacrine. Lancet. 1951;2:755-8. Chung HS, Hann SK. Lupus panniculitis treated by a combination therapy of hydroxychloroquine and quinacrine. J Dermatol. 1997;24:569-72. Yang CS, Kim C, Antaya R. Review of thalidomide use in the pediatric population. J Am Acad Dermatol. 2015;72:703-11. Wienart S, Gadola S, Hunziker T. Facets of lupus erythematosus: Panniculitis responding to thalidomide. J Dtsch Dermatol Ges. 2008;6:214-6. Burrows NP, Walport MJ, Hammond AH, Davey N, Jones RR. Lupus erythematosus profundus with partial C4 deficiency responding to thalidomide. Br J Dermatol. 1991;125:62-7. Hansen CB, Dahle KW. Cutaneous lupus erythematosus. Dermatol Ther. 2012;25:99-111. Cortés-Hernández J, Torres-Salido M, Castro-Marrero J, Vilardell-Tarres M, Ordi-Ros J. Thalidomide in the treatment of refractory cutaneous lupus erythematosus: Prognostic factors of clinical outcome. Br J Dermatol. 2012;166:616-23. Ujiie H, Shimizu T, Ito M, Arita K, Shimizu H. Lupus erythematosus profundus successfully treated with dapsone: Review of the literature. Arch Dermatol. 2006:142:399-401. Fehr J, Hoffman V, Kappeler U. Transient reversal of thrombocytopenia in idiopathic thrombocytopenic purpura by high-dose intravenous gamma globulin. N Engl J Med. 1982;306:1254. Santo JE, Gomes MF, Gomes MJ, Peixoto LC, Pereira S, Acabado A, et al. Intravenous immunoglobulin in lupus panniculitis. Clin Rev Allergy Immunol. 2010;38:307-18. Moreno-Suárez F, Pulpillo-Ruiz A. Rituximab for the treatment of lupus erythematosus panniculitis. Dermatol Ther. 2013;26:415-8. McArdle A, Baker JF. A case of “refractory” lupus erythematosus profundus responsive to rituximab. ClinRheumatol. 2009;28:745-6. Wozniacka A, Salamon M, Lesiak A, McCauliffe DP, Sysa-Jedrzejowska A. The dynamism of cutaneous lupus erythematosus: Mild discoid lupus erythematosus evolving into SLE with SCLE and treatment resistant lupus panniculitis. Clin Rheumatol. 2007;26:1176-9. Kuhn A, Ruland V, Bonsmann G. Cutaneous lupus erythematosus: Update of therapeutic options. Part II. J Am Acad Dermatol. 2011;65:195-213. Saeki Y, Ohshima S, Kurimoto I, Miura H, Suemura M. Maintaining remission of lupus erythematosus profundus (LEP) with cyclosporin A. Lupus. 2000;9:390-2. Ishiguro N, Iwasaki T, Kawashima M, Kawakami M. Intractable ulceration in a patient with lupus erythematosus profundus successfully treated with cyclosporine. Int J Dermatol. 2012; 51:1131-3. Günther C, Aringer M, Lochno M, Kämmerer E, Bauer A, Wozel G, et al. TNF-alpha blockade with infliximab in a patient with lupus erythematosus profundus. Acta Derm Venereol. 2012;92:401-3. Lee H, Kim DS, Chung KY. Adalimumab-induced lupus panniculitis. Lupus. 2014;23:1443-4. Winkelmann RR, Kim GK, Del Rosso JQ. Treatment of cutaneous lupus erythematosus: Review and assessment of treatment benefits based on Oxford Centre for evidence-based medicine. J Clin Aesthet Dermatol. 2013;6:27-38. Boehm IB, Boehm GA, Bauer R. Management of cutaneous lupus erythematosus with low-dose methotrexate: Indication for modulation of inflammatory mechanisms. Rheumatol Int. 1998;18:59-62. Eastham AB, Liang CA, Femia AN, Lee TC, Vleugels RA, Merola JF. 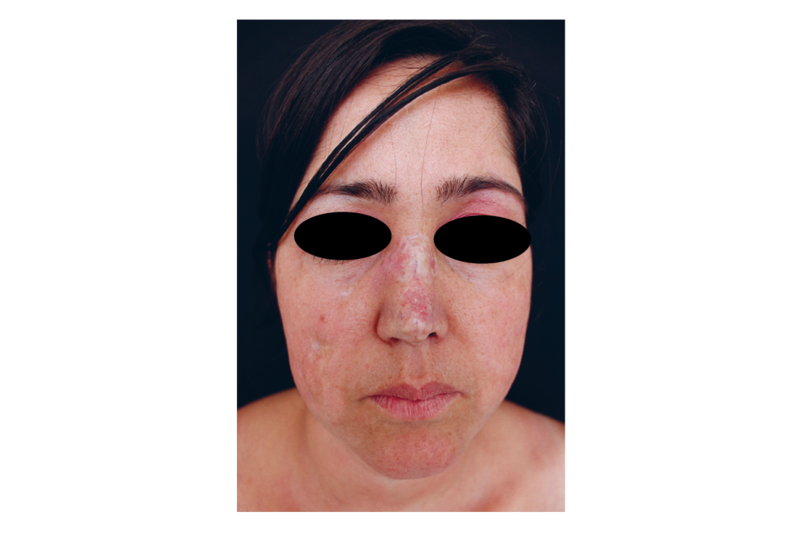 Lupus erythematosus panniculitis-induced facial atrophy: effective treatment with poly-L-lactic acid and hyaluronic acid dermal fillers. J Am Acad Dermatol. 2013;69:260-2. El valor de la ética en las publicaciones: ¿qué es el plagio y cómo podemos evitarlo? Rev Asoc Colomb Dermatol. 2016, 25: 1 (Enero-Marzo), 160-161.